Rita’s Story: A Dream Comes True! I had been looking forward to the day I would get to meet Rita. She is the newest child in our school and our latest child to be sponsored. A few weeks ago, Davis (our Kenyan Director) called me in the U.S. to ask if he could put a little girl in school and in the dorm. He went on to say that she was in a desperate situation. After I heard her story and the pleading in his voice, I told him to put her into the dorm and back into school at once and we would try to find a sponsor for her. Rita comes from our neighborhood in Likuyani. Her family lives in the thatched house at our corner and they are very poor. Rita would often appear at our gate and Davis’s mother would give her food and avocados from the tree in our yard. A few weeks ago, Davis passed by Rita’s home on his way to Eldoret and greeted her grandmother as he went on his way. It was a day like any other day—except that this day turned out to be different. Within hours, and before Davis returned from his business, Rita’s grandmother suddenly died. For Rita, real trouble had just begun. Immediately after the funeral, Rita’s grandfather took her out of school to do the housework and chores. She had become almost like a slave girl without her grandmother to care for her. There was not enough food. There was no soap to keep clean. There was little clothing, and the thatched roof did not keep them dry. Life became even more difficult for Rita. The neighbors noticed and one of them took Rita in temporarily. Because this neighbor had so many other children to care for, she could not keep Rita for long. She came to Davis and asked if his family would take care of Rita. For a night or two, Davis and his family took her in, but they knew it would be difficult to keep her long term. Davis wanted to help Rita, and he dreamed of a brighter future for her. He hoped she could become a part of Heritage Academy where she would be loved, fed, clothed, and cared for. His dream came true when a sponsor came forward to help Rita. She is a darling little girl with lots of charm. Whenever you mention her name, people smile. We are thankful that Rita has bright hope for tomorrow thanks to her new sponsor and Heritage Academy leaders. When I saw Rita, she was so very happy. Her joy is contagious to all who know her. Thank you, dear sponsors, for your generosity. And thank you, Davis, for your compassion for the least of these. Margaret shares a story of the way God used a visitor to intersect and detour the life of a family in an amazing and wonderful way! Mary was one of our summer visitors. A highlight of her trip was to visit her sponsored child, Francis. Mary was all smiles for sure when she met Francis and he kept grinning as well. We first visited the home of Francis’s uncle, where we learned that the child goes back and forth between 2 homes. We decided to change our afternoon plans and also go visit Francis’s other home with his grandmother. At the grandmother’s compound, John (another member of the visiting group) was curious about other homes on the compound and did some walking around. At one home he noticed a baby that had something terribly wrong. After checking out the child and talking to the mother, Davis learned that the child had been seriously burned about 10 days earlier. Davis immediately said, “Margaret, we need to change our plans for tomorrow. We need to take this baby to the hospital.” Sometimes I think I have seen everything in the village and then there is something more distressing. I had the feeling that this mother was holding her infant child, just waiting for the child to die. The next day, we took the mother, dad, and baby to see a doctor in Eldoret that we trust, Dr. Koesch. The baby cried most of the trip and so did I. We waited for hours to see the doctor. When he was finally able to examine the baby, I thought he was going to cry as well. This is a city doctor and there is such a gap in healthcare between the city and our village. After examining the baby, Dr. Koesch looked out the window for a while trying to decide what he should do. Finally he turned to me and said, “This child has been covered with herbs that are not sterilized. The child will get a terrible infection if this is not cleaned off and proper medication given. It will be very painful to clean the child. She must be hospitalized.” Even now as I am writing to you, I have tears thinking back on this moment. I said to him, “Dr. Koesch, we are prepared to do whatever you think is necessary to save this child.” We agreed to put the child, Tamara, in the private hospital in Eldoret. Davis and I took the little family to the private hospital and left them there for the night. The next day we sent Pastor Joseph to pay the hospital bill and bring them home. He learned how to take care of the baby, helped teach the mother, and agreed to keep a close watch on the situation over the coming weeks. Pastor Joseph spent quite a bit of time with the baby’s mother Faith, and during this time learned that Faith had graduated from high school with a fairly good grade—AND she dreamed of becoming a teacher. Oh my, when Pastor Joseph told me this I was astounded. We believed that God had detoured us from our original plans so that we could learn about baby Tamara and help the family get proper care for her, and now it looked like there was more to the story! This is where my friend Lois comes into the picture. She had visited us in the village earlier in the summer. Before leaving, Lois felt called to “help two women have a chance to change their lives,” and provided funds to send two women to Heritage College to become teachers. When I learned about Faith’s dream to become a teacher, I immediately remembered Lois’s words and gift. We were able to tell Faith that we had a place for her in Heritage College and that someone had paid for her training. Can you imagine the smile on her face, the joy in her heart? First of all, her baby Tamara would live and not die as she had thought, and now even another miracle might happen in her life—her dream of becoming a teacher could become a reality. We had a heart-to-heart, head on talk with Anthony, her husband. He and the family on the compound agreed that they fully supported Faith to go to college for this two- year commitment. guidance and love, we are seeing lives change. May God be glorified in all these things! Dr. Terry Horner (known affectionately as Dr. Terry in the village) traveled to Makutano to provide care and medical knowledge to the people of the village. After six weeks, Dr. Terry was inspired by what he saw and the compassion, care, and charity he saw all around him in the village. I recently returned from an uplifting and inspiring six-week trip in Makutano, Kenya, where I worked with Village Project Africa. I wanted to go back for my second time, because I saw last year how much work needed to be done to improve medical, agricultural, and educational facilities. I feel it is my calling from God to help the village people, who have spiritually-inspired me and become my friends. We continued Village Project Africa’s mission to help current and future generations of this impoverished village break the chains of poverty. Last year, I stayed three weeks with the group and refreshed my childhood farming skills. Over the course of this year, Village Project Africa transformed the school garden into a larger garden with a greenhouse for tomatoes and cabbage. Village Project Africa now has self-sustaining produce that they eat and even sell. To complement the produce, a farm manager now cares for 200 chickens and three cows. The focus of this year’s trip was to expand a small medical clinic with one practitioner, who sees 500 students for free. I realized how difficult it can be to care for the children and families when I couldn’t access current technology in a comfortable environment like at home. Village Project Africa proposed a much larger clinic with laboratory services to help treat patients based on a diagnosis, rather than by symptoms. In addition, maternity services with pre- and postnatal care and deliveries will be initiated to reduce the infant and maternal mortality rate. better treatment options at this facility. Once the plans are approved, we can start construction. We plan to return next year with a larger medical team from the U.S. to provide a free clinic. A few days before I arrived, a Kenyan medical student started volunteering at our clinic. His story caught my attention because he lost both of his parents at a young age and he was interested in becoming a neurosurgeon. He told me he struggled with school, but said he remembered his father’s advice that education was the key to success. He paid more attention to his studies and his hard work paid off when he became the only student in his secondary school’s history to receive perfect grades. In addition, he scored 37thon a test among 67,000 students in Western Kenya. Despite being admitted to the medical school at Kenyetta University, he could not pay for more than one semester. For the next six weeks, he amazed me at how much he knew about medicine with only one semester of medical school. His potential is great, and he wants to stay in Kenya to become the fourth neurosurgeon in his country. Village Project Africa promised him financial support during seven years of medical school. In exchange, he agreed to stay and practice in Kenya. Finally, the local school called the Heritage Academy has been booming. There are more than 500 students now and a new 6th grade will add 100 more children. The government signed off on plans to start building a dining hall/conference center. Among other benefits, it will give children a place to eat out of the dust and rain. As a physician, I am always grateful for the chance to help someone physically, but this also gives me the opportunity to share my faith through service. I thank all of my patients, colleagues, and friends for their support. Being a part of Village Project Africa has changed my life by showing me the purest forms of compassion, care, and charity in Makutano. I met Damaris on my first trip to Africa in 2008. My family organized a Bible school for the children at the school and she was there. I noticed her several times throughout the day, always standing alone and away from the other children. Slowly, over the course of the day, she made her way closer and closer to me and finally reached out to hold my hand. In all my years of teaching, I had never seen a child with such a haunted expression. The day was over too soon and it was time for us to leave. We boarded the bus and one hundred or more children crowded the bank by the road, waving goodbye. I was waving at all the children when I saw Damaris making her way slowly along the back of the crowd, looking in every window of the bus. When she saw me sitting towards the back, she ran down until she was directly below my window. She reached her hand up and we held hands out the window until the bus pulled out to leave. Little did I know, my life would never be the same! A few months after a return trip to Kenya and a visit with Morgan and Damaris, I could not stop thinking about them both. I truly believe God was putting them in my mind because something was wrong. I got in touch with Margaret and Davis and they again went to check on the family. When they arrived at their home, they discovered Morgan was very sick—in fact, he was dying. Davis got him to the hospital and through treatment Morgan got well. He now takes care of the chickens at Heritage Academy! The way God allowed us to connect with this family was truly a miracle. He first allowed me to form a special bond with Damaris and used that connection to make a difference in (and surely save!) Morgan’s life. It is impossible for me to fully explain how my knowing this little girl in Africa has helped me experience God’s faithfulness and grace more fully. Damarius and I still share a very special relationship and, while she was my first, I now sponsor 10 other children. I have the privilege of seeing the lives of the four girls I sponsor in the dorm change before my eyes. The haunted faces are replaced by shy smiles and giggles. the lives of these children more full and abundant in their knowledge and certainty that someone loves them. We are thankful for Sandra, and the many sponsors who have come after her and found amazing, life-changing connections with children! In January we told you a little bit about a girl who had been brought to our school who’d had a very difficult life so far. We are so grateful to the “Lydia’s Ladies” at Church at the Crossing in Indianapolis for deciding to sponsor Risper so that she can stay at Heritage Academy and be one of the first residents of our new dorm! Risper Anyona is now 14 years old and her story is the story of a survivor. She was born in 1997, and her mother died when she was very young–she doesn’t even remember her mother. In 2008, her father also died, leaving her in the care of her stepmother. To put it politely, this was not a good situation. Risper had been 10 years old before she was permitted to start school. She made it through class 4 before her stepmother refused to allow her to continue any longer. The stepmother continually harassed Risper and made life extremely difficult before she was finally thrown out of the house. We are pleased that we had a place for Risper to live and are able to provide for her daily bread. Soon a dorm will be finished and she will live with other girls from Heritage under the care of the matron. Risper is a polite, delightful child. She is in the Heritage Choir and plays sports with the other children. When she grows up she would like to be a teacher and then help the needy. We are so happy to have her in our midst and blessed for the opportunity that we have to help her grow into the likeness of Christ and to dream big dreams for the future! 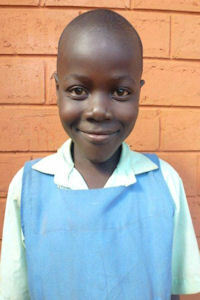 Please continue to pray for Risper and the other girls who will be moving into our dorm!